Charles A. Wilson was born in August 1890 in New York. William Simpson Wilson and Kate DeYoung appeared in the New York state census of 16 February 1892 in Buffalo, Erie County, New York. Other members of the household included Charles A. Wilson, Ida Jeanette Wilson, Margaret Blanche Wilson, Grace M. Wilson, William Edward Wilson, Hannah Heath Wilson and Kate R. Wilson. William Simpson Wilson and Kate DeYoung appeared in the US federal census of 1 June 1900 in Buffalo, Erie County, New York, at 30 Maywood. Other members of the household included Charles A. Wilson, Ida Jeanette Wilson, Grace M. Wilson, William Edward Wilson, Hannah Heath Wilson, Kate R. Wilson, Herbert Longsdale Wilson and Harriet C. Wilson. Daughter Grace also is enumerated in the household of her sister Margaret Devine. William Simpson Wilson and Kate DeYoung appeared in the US federal census of 15 April 1910 in Buffalo, Erie County, New York, at 153 Howell Street enumerated next to daughter Ida Chapin.. Other members of the household included Charles A. Wilson, William Edward Wilson, Herbert Longsdale Wilson and Harriet C. Wilson. Charles A. Wilson appeared in the US federal census of 15 April 1910 in Buffalo, New York, at 153 Howell Street. He was a machinist in a foundry, according to the 1910 census. At the time of his death Charles A. Wilson was living in Buffalo, Erie County, New York, at 152 Howell Street. William Edward Wilson appeared in the New York state census of 1 June 1915 in Buffalo, New York, at 153 Howell Street. Other members of the household included Charles A. Wilson, Kate DeYoung, Herbert Longsdale Wilson and Harriet C. Wilson. He was a machinist, according to the 1915 census. Charles A. Wilson died on 5 August 1917 in Cheektowaga, Erie County, New York. 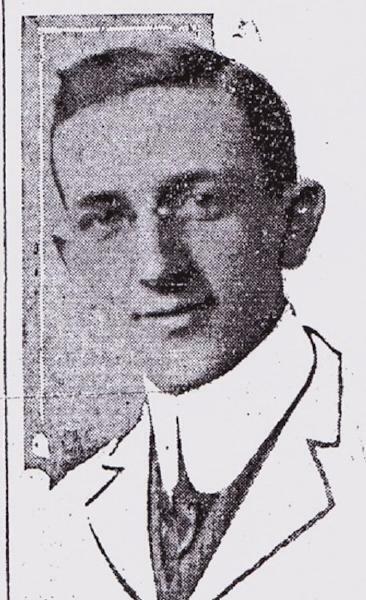 The following appeared on 6 August 1917 in the Buffalo Evening News: Charles A. Wilson, 26, of 153 Howell street and Arthur Venator, 24, of 341 Virginia street were killed at 3 o'clock yesterday morning when an automobile in which they were riding with three other men was struck by a passenger train at the Broadway crossing of the Delaware, Lackawanna & Western railroad, about four miles beyond the Buffalo city line. The passenger train was traveling at the rate of a mile a minute when it struck the automobile. Nicholas Hamm, 27, of 236 Gorton street, the driver of the car, was ordered arrested by Medical Examiner Stocker. On direction of Assistant District Attorney Moot, Hamm this morning was charged with second degree manslaughter. He will be given a hearing in Cheektowaga tomorrow. Hamm, Charles Seeger of 348 Auburn avenue and Peter Reinhart of 27 Arnold street, were only slightly bruised as the result of the accident. The five men had been to Lancaster and were returning to the city. The gates at the Lackawanna crossing were lowered and the swiftly moving train was about 150 feet from the crossing when the touring car approached. The automobile crashed through the gates and was in the center of the tracks when it was struck by the flyer. Wilson and Venator were thrown 25 feet and when picked up were dead. The other men were thrown to one side of the track with the wreckage and were picked up by the crew of the train. They were then brought to Buffalo. When Dr. Stocker arrived on the scene to investigate he found that the driver of the automobile had driven through the gates and he immediately ordered him held, which is customary until after an inquest is held. Yesterday afternoon it was reported to Dr. Stocker pieces of flesh were found on the tracks where the accident occurred, and that laborers buried them in a field nearby. Dr. Stocker is investigating this report. Wilson was the son of Mrs. Kate DeYoung and the late William S. Wilson. He was the brother to Mrs. George Cahpin, Mrs. Charles DeVine, Mrs. Thomas Benton, Mrs. John Mertz, Mrs. Albert Hodges, William E. and Herbert L. Wilson of Buffalo and Mrs. E. Brown of Hamilton, Ont. The funeral will be held Wednesday afternoon. Venator was married and lived at the Virginia street address with his wife. He will be buried tomorrow afternoon from an undertaking establishment at 190 Oxford avenue. The following appeared in a local newspaper: [Died] Suddenly, at Forks, N. Y., August 5, 1917, Charles A., son of Kate DeYoung and the late William S. Wilson, brother of Mrs. George Chapin, Mrs. C. DeVine, Mrs. T. Benton, Mrs. J. Mertz, Mrs. A. Hodge, William E. and Herbert L. Wilson of this city and Mrs. E. Brown of Hamilton, Ont. Funeral from his late residence, No 153 Howell street, Wednesday afternoon at 2.30 o'clock. Friends are invited to attend. Funeral car. Deceased was a member of Mizpah lodge, No 518 I.O.O.F.